We're doing the movie round up early today because obviously the Sun is going to devour the Earth sometime around 2pm. Someone should really send a team of scientists up there to sort that fiery thing out. 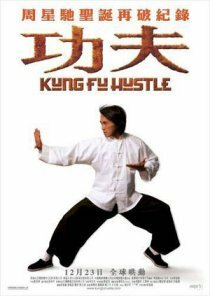 We try our best to be ahead of the pack and today we can put our feet up and skim read all the reviews of Stephen Chow's Kung Fu Hustle with a very self-satisfied "Oh we saw that ages ago". We hope some of you did too as it was one of our recommendations on multiregional DVD back in March. Comparing Kung Fu Hustle to House of Flying Daggers is like comparing Brotherhood of the Wolf to The Umbrellas of Cherbourg. We can't stand that kind of lazy reviewing so we'll add Mr Christopher to our List of Dicks until he learns not to compare two completely different movies to one another simply because they both happen to be subtitled. Yet however much damage limitation the script crams in, these are still people who open their mouths to show each other the semi-masticated food inside (as if someone as thin as Peet would ever go near a convenience store pie anyway). So they'll finally get together and have lots of little halfwit children. And not only are we meant to care, we're supposed to celebrate? Ahh Wendy, we've been saying that celebrities should be sterilised for years. So what's left? Did the Independent see any films this week or did they just work on their tans? Well Anthony Quinn only saw two films, but still managed to stuff them together on the same page so we'll follow his lead and give you a very quick round up of In My Father's Den and Evil. 3 stars for the former ("the last 20 minutes careen off the road into melodrama") and a slightly better 4 stars for the latter ("Not since Tom Brown was persecuted by Flashman has there been such a torrid tale of school bullying as Mikael Hafstrom's splendid drama Evil"). James Christopher is with Quinn on In My Father's Den but Wendy is so-so over Evil - 3 stars each. The Guardian offers a different view with Bradshaw throwing a single star towards Evil ("the solemn anti-bullying message is undermined by its lip-smacking enthusiasm for face-smashing punch-ups") and only 2 stars for Den "in which touristy panoramas of the landscape are given ponderous emphasis and characters do sensitive things like hold a starfish up to the light and gaze at it"
That's your lot then. Go see Kung Fu Hustle in a nice air conditioned cinema and try not to be too mad at the Americans who get to go and see George Romero's Land of the Dead today. Bastards. Trailer of the week? The Heart Is Deceitful Above All Things.